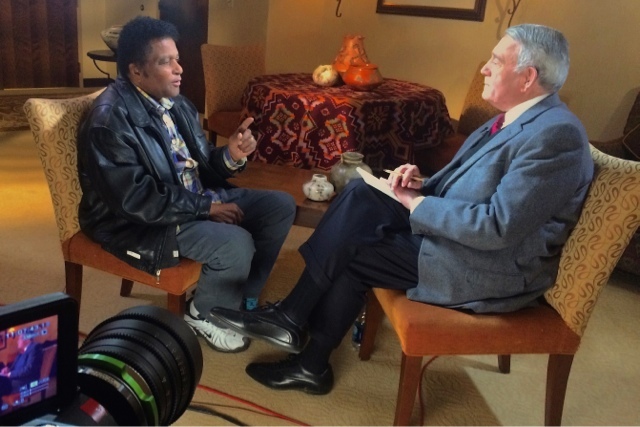 NASHVILLE, Tenn. (June 16, 2016) – Beloved Country music pioneer Charley Pride sits down with Dan Rather for THE BIG INTERVIEW on Monday, June 20, at 10:30am ET. During the candid hour-long conversation, the Grammy-winning singer opens up about his early life as one of 11 children, picking cotton in the fields of the Mississippi Delta, as well as his introduction to music, the songs that inspired him, and his first guitar. Growing up in the Mississippi Delta, Pride had a childhood that was much different from those of his modern contemporaries. Pride describes his early life saying, “I learned that you had to share a lot, and [that] you bang one another upside the head a lot, and try to get a biscuit before the other one. We lived in what we called a ‘shotgun house’, and there was a bed over on this side and a bed over on this side, and we’d sleep three and four to a bed. I remember sometimes I’d wake up and my brother’s toes were right in my nose. We grew up on a farm, and we all had something to do. In the evenings, either me or my brother would go get real dry chips [so] my mother could start the fire in the morning prior to us going and chopping the cotton… I walked four miles to school and four miles back. That’s where I grew up." On the first music that he heard as a child, Pride says, “My mom and dad liked Gospel music, so they used to listen to the Five Blind Boys from both Alabama and Mississippi.” But, Pride reveals that one of the songs from his childhood that still sticks out to him is the classic Hank Williams hymn “I’ll Have A New Body (I’ll Have A New Life).” He was also exposed to music from Bill Monroe, his father's favorite bluegrass singer. It's one of the sentimental reasons that Pride included Monroe's song "Mansions For Me" on Pride & Joy: A Gospel Music Collection, his 2006 studio album. Primarily known as a singer, Pride says his introduction to the guitar was anything but smooth. Reminiscing about his first guitar, Pride says, “My mother ordered me a guitar for 14 bucks from Sears Roebuck… we got it over in the evening… and I left it in the wagon and it rained. It was just glued together, you know. It was called Silvertone. I kept trying to tune it, and it just kept bowing and bowing with strings [and] the glue around it. And my mother was walking up on the porch, it was probably about 105 degrees, and she heard something go *BOOOIIIIIINNNNG*. And she said, ‘Boy, you better go up there and look at your box! The rats are running over it.’"
To see more of this in-depth episode, be sure to tune in to THE BIG INTERVIEW Monday, June 20, at 10:30am ET, only on AXS TV.